The year is 3200 and mankind's empire lies in ashes. The Jump Gates fell six hundred years ago, severing the links between the myriad worlds of the human diaspora. Now, the long isolation of the Silence falls away as men and women return to the skies above their scattered worlds. Will you be among them once more? 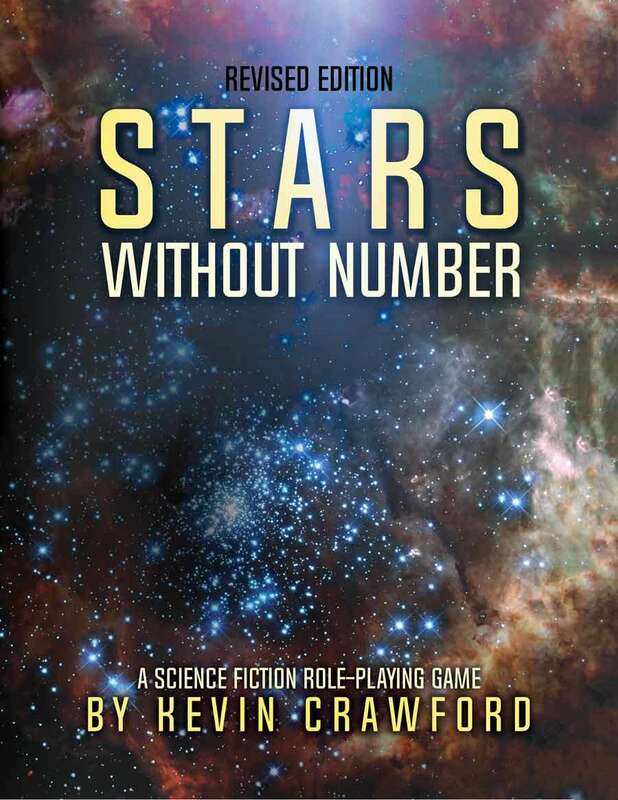 Stars Without Number: Revised Edition is an old-school-inspired game of sci-fi adventure, one built from the ground up to encourage sandbox play and simplify a GM's job in providing it. Familiar mechanics are employed to forge new worlds and explore new possibilities, guidelines built on long experience used to help a group venture in wholly new directions. Within the full-color pages of Stars Without Number: Revised Edition, you'll find… . Backwards compatibility, as the Revised Edition is built to work cleanly with existing Stars Without Number supplements and materials. The new systems slot in smoothly, and you can take or leave them individually as your group prefers. Expanded character creation, with PCs now customized by special talents and character foci, new options for psychic characters, and new ways to make your hero mechanically distinct. Yet the process is still smooth and quick, with a special quick generator spread to create a hero from nothing more than a half-dozen die rolls. Refined psionics, with more options to distinguish your psychic hero's powers and more flexible choices for their abilities. Tailor your psychic to your concept, whether as a cynical gunslinging brainguard or an ascetic psychic healer from a world of austere psionic scholars. Improved starship combat, with decisive roles for every member of the party. Build your own starships with the included system and employ new hardware and new starship mods to make your ungainly crate the fastest contraband runner this side of the Veil Nebula. New systems to support additional types of play, including rules for hacking, remote drones, and expert technical modification of gear and starships. Upgraded tools for sandbox sector creation, with forty new world tags to help define a GM's stellar creations, guides for adding additional system points of interest, and material to help a GM define the interesting traits of the worlds they create. These tools aren't just a clump of random tables, they're a framework to boost your own creativity and help you make fast, good, playable material for your game. Augmented adventure creation guidelines. Aside from a hundred piping-hot adventure seeds that mesh smoothly with the world creation tools, Stars Without Number: Revised Edition also includes content to help you turn your vague ideas into a playable evening's adventure. Guidelines on challenges, rewards, and complications in play are all aimed toward the working GM, the man or woman who's not just theorizing their adventures, but actually responsible for making something fun for the whole group. Tools for creating aliens, Virtual Intelligences, and hostile human foes, with guidelines for handling potentially-hostile encounters and creating the kind of fearsome xenobeasts that can challenge the doughtiest explorer. Or perhaps you want to be an alien or robot? You'll find the tools for that in Stars Without Number: Revised Edition. Faction rules, for handling the background warring and intrigues of hostile groups. Need to add life and motion to your stellar sectors? Sprinkle in a few factions to make news for the PCs to respond to, or use these rules to handle the colonies, spy agencies, mercenary companies, or other enterprises your heroes establish. Transhuman tech, with rules for bodyswapping, digital identities, post-scarcity economics, and just as importantly, GM guidelines on making exciting adventures when all the old pillars of familiarity have fallen away. True AIs, the vast and terrible intellects that can bring forth wonders and ruin in equal measure. Playing a synthetic VI or aspiring organic godmind? Learn how your PC can accumulate the tech they need to ascend to this new plane of being. Mechs, for those GMs who relish the thunder of steel titans on their far-future battlefields. Heroic PCs, for groups that want to trade the gritty, lethal tone of a standard campaign for classic space opera, with larger-than-life heroes and superhuman skills. Society creation, customizing a world or a hab with its own culture and history, pre-designed with fault lines and conflicts to engage your heroes. You'll get more than a dry recounting of details; you'll get the information you need to build adventures that fit with this world's smouldering tensions. Space Magic, with rules and guidelines for introducing sorcerous powers and old-school magic into your starfaring adventurers, with sagacious Magisters, versatile Arcanists, and Adepts graced with supernatural powers. So leap forward, brave adventurer! The stars await you, and the wild glories of an untamed sky! Does this book include all the information from the little supplements I see on Drivethru? There's no overlap between the core book and the currently-available supplements. Skyward Steel has an optional space combat system that's largely superseded by SWN:R, and I recall putting some of Polychrome's cyberware into the core book list, but all the content in the other supplements is unrepeated in the core book. What will be the best way to get in contact with you after G+ is completely dead Mr. Crawford? Are you migrating somewhere else? A Discord channel maybe? He is very prolific and quick to answer questions on the SWN reddit. I did a little internet research and fund my answer. Inkjet vs digital print. Standard's colors are a bit less vibrant. Paper quality is the same. Is there a way to update the psionic disciplines from the new earth cult books into the revised edition? I've had a lot of fun using the cult of the still lady supplement in my campaigns, and I would love to be able to use it here as well. I've always ignored Stars Without Number for years because I always thought it was just a bland game until I saw the new arts in the free version and that alternative cover art. Alas, a different cover would require a different product entry, ISBN, and proof cycle, which is regrettably impractical. I'm very pleased with Jeff Brown's work myself, but I can understand that other people might have different tastes. $4.99 is outrageous... if you don't already own this, grab it now. Is the space magic section a love letter to Destiny, perhaps? I noticed that the chart on page 78 states that a world needs a minimum TL of 5 in order to construct a Gravtank, but there are references that state that they are employed by TL 4 worlds. Is this a typo? That's a typo; gravtanks fit in with standard TL4 levels of gravitic control. We need a soft cover ( lower cost) option for SWN. Is there a possibility of this happening? Unfortunately, the most a softcover would cut from the price is $5, and it'd cut down on its durability. So maybe I am a little dense but what ammo type am I needing for mag weapons? From what I am reading it's just the standard ammo that you buy in 20 round packages, is this correct? "For simplicity during play, ammunition calibers aren’t tracked; a bullet is a bullet when it comes to feeding your favorite gun." Congrats on the release of the Revised Edition. I used my code to purchase this title (I was a Kickstarter Backer). However, there are no download links on the product page, and it does not show in my library. On this page it does show that I have purchased this title. Could you check into this for me? Thanks, I truly appreciate it. Did you back at the $35 Von Neumann machine level? If so, there were several codes. The PoD Coupon was separate from the PDF coupon. If you definitely clicked the PDF coupon, and it's still not there, you'll probably have to contact DTRPG customer support about it. Kevin's not got the capacity to troubleshoot database errors on their end. Is a .mobi file included with purchase like Godbound? If not, that would really be appreciated! Greeting, i purchased the complete revised edition, and i have a question, in the book you talk about using LOTFP, Labyrinth (so i guess ORSIC can work to) but do plan to make a race guide for SWN or should i use OSR game as a matrix to create them ? I don't have any canonical alien race guide in mind at the moment- that sort of thing tends to work best on a campaign-by-campaign basis for GMs. You could theoretically use any alien or fantasy species of your choice with the game. Just use the guidelines for Origin Foci and building alien races if you're keen on making them PC-available. Hey! I like SWN so far, however the included epub and mobi versions lack the bookmarks. The PDF has proper bookmarks and is easy to navigate, however the mobi version really would need similar bookmarks. The TOC in front doesn't reliably work (some links go back to page 1 instead of to the mentioned number). It's a bit of a hassle. It would be great to get updated files for this. Thank you! This title was added to our catalog on December 29, 2017.